It’s been two years since the Dubliner heaved the 27 lb Wanamaker Trophy to the skies at Oakland Hills. But he insists he’s ready to win major No 4 and complete a double whammy by securing his sixth Ryder Cup cap this week. Harrington has had a tough time since he crushed Sergio Garcia down the stretch at Oakland hills, missing 14 cuts and consoling himself with 16 top-10 finishes. But after finishing second in the Irish Open and ninth at Firestone over the past fortnight, he believes his game ready to peak after a disappointing year in the majors so far. He said: “If I get my preparation right this week, I can do no more than that. At a major, if you don’ get your preparation right, you feel like you have lost an opportunity. Harrington missed the cut in the Masters and the Open and came home just 22nd behind Graeme McDowell in the US Open at Pebble Beach. And while feels good about his chances at Whistling Straits, he knows he’s in for a tough week on a links-style track where he limped home tied for 48th six years ago. He said: “It’s a great course. But it’s tough. I remember there were a lot of crosswinds whipping across there - holes like the first where it’s a dog leg with the wind coming off the wrong side. 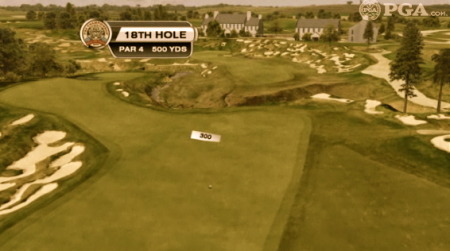 That’s a nasty hole to hit the fairway on. “There are a lot of tough driving holes and plenty of treachery out there and you have got to play well. “I remember it played like a links. You could get 30 or 40 yards of run on the ball and even though it is a long course, it didn’t play long once you got your driver in hand and hit it. Harrington drove the ball well at Firestone and a similar performance in Wisconsin should see him make the European Ryder Cup team automatically. While he picked up a cheque for €96,787, he remained 10th in the race for nine automatic places in Colin Montgomerie’s side. He’s now just €13,245 behind last man Miguel Angel Jimenez but he wants to avoid the need for one of Monty’s three wildcards. If he fails to make it into the side this week, he could be forced to skip the first leg of the US Tour’s FedExCup series - the Barclays Classic - and head to Gleneagles for the final counting Johnnie Walker Classic. Refusing to think that far ahead just yet, Harrington said: “At the end of the day, I can only play my golf and I still have the US PGA. As for his disappointing year in the majors so far, he said: “I prepared well for the US Open and the Open and I did an okay job for the Masters. Again, I always go into the Masters like I need to play one or two more events. “At the Open I got blown off track and at the US Open it wasn’t a bad week , but it could have been a lot better.